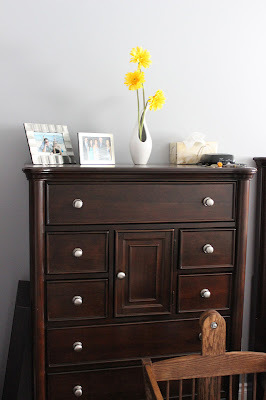 Naked Cupcakes: Our Bedroom - Final Reno's! The decals are from Etsy, and once again we love them! They were so easy to put up, and brought a bit of brightness into our room with minimal effort. I attempted being 'crafty' by putting together the vase and flowers; crafts are not my forte! But I am pretty happy with how it turned out. But the best part of our room? This gorgeous cradle my dad built for the baby!! He even got a mattress made to fit it, and then my mom sewed me some custom sheets and crocheted me a beautiful blanket too. How spoiled are we?